It has many times been reported by our blog guests while installing custom ROMs like MIUI 9 or Flyme OS for Lenovo A6000 or trying to root their device they have never reached the home screen on their device after that. 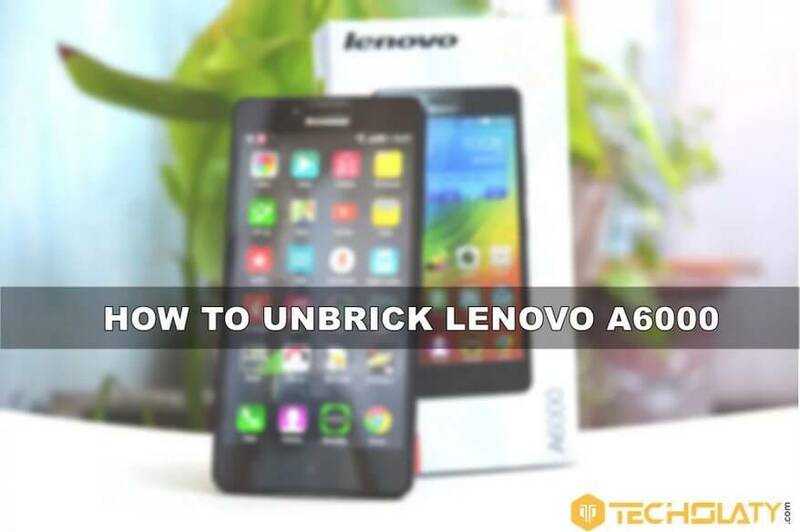 A simple method here which will help you how to unbrick Lenovo A6000 and will let you revert back to the previous state or the default state which came out of the box. Also, this method will help you to bring back your KitKat operating system on your Lenovo A6000 if you have bricked it and went to a boot loop or your Lenovo A6000 is stuck at the boot screen forever. You can unbrick your Lenovo A6000 within few minutes after downloading the required Drivers for Lenovo A6000 and the Official Firmware. Please be advised that you need an access to a computer or a laptop for unbricking your device. There are two methods to unbrick your Lenovo A6000 which is by installing the FIRMWARE using QFIL on your Lenovo Device which is based on Qualcomm Chip and the second method is by installing the Lenovo A6000 FIRMWARE using Lenovo Downloader. Check whether to install the necessary drivers. (Open the Device Manager on your PC, then turn off the device and take out the USB-cable from the device (if it was connected). Installing the firmware using Lenovo Downloaders. To install the device in 9091 modes, I recommend to start the process of firmware A6000 turn off, holding down the Volume up, turn the power button A6000, after vibration, release the power button, and then after a couple of seconds, releasing the volume – set the device to PC mode 9091. Download and extract to a folder without spaces and letters Downloader_Lenovo_V1.0.2.7z (he and the driver came with firmware). Run as administrator flasher. Turn off your smartphone, after the first start by entering the region code after changing the region recommend to immediately wipe do – and use your smartphone! Hello Shubham, sad to hear that. Can you tell me if you have installed all the drivers that I have mentioned in the article? Message me on Facebook or mail me using the contact page. Thanks method 1 worked on first go for me. Fixed my device A6000 using 2nd method.Thanks for the support. The whole process is shown for lenovo a6000….will the same method work for a6000 plus….cause the firmwares are different for both the devices….plz help!! How can to get 9091? I have try much and still don’t get that .. Links updated, thanks for informing us. My Phone Was Not Navigating 2 FASTBOOT MODE and also vibrating constantly No LOGO is apperaing PLS….HELP……!!!!! so…instead of 9091…what shuld i do do bring it in Qualcomm HS-USB loader 9008(com3)…. since i have tried by pressing vol+ button and connecting d usb cable.. it shows only dis thing.